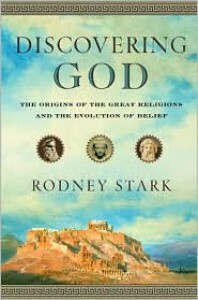 Rodney Stark's Discovering God is wide ranging work that attempts to explain the emergence of "revealed" and/or "moralistic" religions beginning in the Axial Age of the 6th and 7th centuries BC, when many of the great religious figures and movements arose. I really enjoyed his earlier book, On the Rise of Christianity, where he applied sociological techniques to explain the appeal and success of Christianity. Above and beyond that, his description of life in an ancient city (in this case Antioch) was breathtaking and horrifying. It's amazing the conditions in which human beings will consent to live. Lately, alas, his books have tended to be Christian apologias that detract from the force of his objective arguments regarding why religions appeal to people and how they effect conversion, diluting the power of his insights. This is true of the last third or so of Discovering God. The first two-thirds, where he deals with non-Christian/non-Islamic religions, argues persuasively for his theory that a "free market" of religious ideas creates a population that is more intensely religious and committed to "discovering God," however that concept may be defined since many East Asian traditions can dispense with god figures entirely, and that such situations occurred during the Axial Age, under Roman rule before Constantine, and in America. The last hundred pages of the book, focusing on Christ and Mohammad, clearly show his pro-Christian bias and are the weakest part of the book. In the conclusion, he drops all pretense of neutrality and asserts that what he's been chronicling is a "discovery" of God, not an "evolution" of the concept of deity. He even has the gall to dismiss all East Asian religions because they don't "reveal" god, and Islam is inferior because it's a regression from the Christian advances made in understanding God. On the other hand, Stark's cavalier dismissal of the Buddha's, Laozi's and Confucius' spiritual insights two pages later is insulting and uncalled for. Simply because Gautama, the Old Master and Master Kung may have dismissed the questions Stark considers important and appropriate doesn't render them irrelevant. As to the first, there is no need for a conscious divinity to construct a morality. It appears to help immensely in getting people to accept it (after all, it's easier to believe "God" has more insight into what constitutes moral behavior than Joe Schmo, your neighbor) but from my perspective that's about all it does. My attraction to the more intellectually rigorous forms of Buddhism (i.e., Zen) arises from that severance of dependence upon an external source to enforce "right action." The second criterion simply baffles me. If religions arise in response to perceived spiritual needs that are not being satisfied (which is what Stark argues for earlier in the book), then whether God or gods is invoked is irrelevant. Monotheism may ultimately be the most logical/rational explanation of any divine existence/plan for the universe but why is the "golden rule" any less legitimate if promulgated by an Olympian Council, Taoist Immortals, the Son of God or Islamic mullahs? The third criterion also seems nonsensical. Islam may have begun as a relatively uncomplex revelation geared to the understanding of Bedouin tribesmen but many, many imams and philosophers have elaborated upon it in the interim. And the same is true of Christianity. The early Church Fathers turned somersaults developing Christian theology from the sketchy sayings of the Jewish carpenter. The first three centuries of the Christian era were a "Wild West" of competing and increasingly complex theologies. 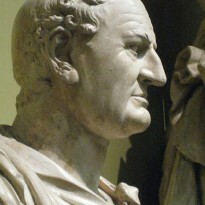 Even after it became Rome's state religion, the educated elites continued to dispute (viz., the controversy over "homoousias" vs. "homoiousias"). Stark goes off the deep end starting on p. 394, where he asserts, with no proof (of course, since it's a matter of faith) that "Christianity epitomizes revealed religion and offers a substantially more complex and nuanced vision of God...." He condemns Islam for its support of theocracies, repression of innovation, and belief in an ultimately irrational and unpredictable God. Examples with which Christianity also abounds. But the faults he lays at Islam's feet seem to be endemic to the "human condition." Anytime a faith, or a polity or a corporation gets a monopoly or near-monopoly it then goes about stifling the competition. Democracy developed in the West despite Christianity, not because of it; we have the utterly pagan Athenians to thank for the seeds that eventually grew into the Western democracies. As an afterthought (or so it seems to this reader), Stark tacks on a final argument for the existence of God by invoking the specious arguments of the Intelligent Design movement, whose theories about the irreducible complexity of organisms like the eye or wings have been demolished time after time in the scientific literature. In sum, Dr. Stark reaches some very convincing insights in the development and propagation of religious ideas but his otherwise worthy effort is undermined by his obvious bias toward Christianity as the definitive answer to man's search for meaning in the universe.